Here are some ideas that may make your life with a Triumph Spitfire a bit easier or better. They are mainly based on my own personal experience but some have also come from emails I have received and other articles in magazines. I’ve also included advice I’ve been given by other Triumph Spitfire owners at classic car shows. Of course these ideas are just suggestions and I can accept no responsibility for any unforeseen consequences that may follow. The ideas are laid out in three sections with a page for each one – buying a Triumph Spitfire, actually owning a Triumph Spitfire, and selling a Triumph Spitfire. 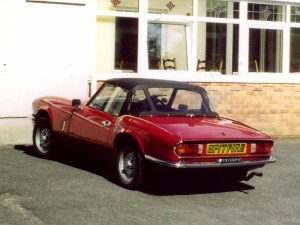 Our Triumph Spitfire was our transportation for our honeymoon in South Wales. Here it's at a guest house on the Gower Peninsula.